Buttons with specific temperatures make cooking more convenient. Just press the button for the temperature you want and you're on your way. Sealed burners protect the inner workings of this range from messes and spills. Clean-up is much quicker and easier with sealed burners because it is impossible for the mess to seep under the burners. Stay at ease during chaotic meal times, knowing that no matter how big of a mess there might be, clean up will be no problem. Just a touch of your finger will change the bake or broil settings on this oven. Quickly and effortlessly manipulate the temperature of the oven, and set timers to alert you when dinner is ready. Work on side dishes, or just sit back, relax, and focus on something else while your dish is cooking. You can even lockout the controls to safeguard your family from unintentional use of the oven. While you finish up cooking and setting the table, any food that is done early can be kept warm in the oven without over cooking. Warm hold can be set between 145ºF and 190ºF. 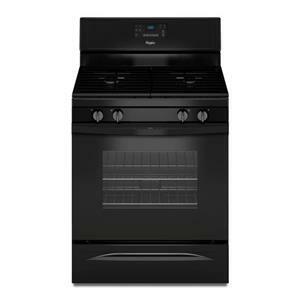 This 30-inch Amana® Gas Range with 5.0 cu. ft. Capacity lets you melt, boil and simmer all at once with a Versatile Cooktop. Use Bake Assist Temps to take care of dessert at the same time. Simply pick a preset temperature settings to get started. And when it's time for cleanup, use the Self-Clean Option to let the oven do the dirty work for you. 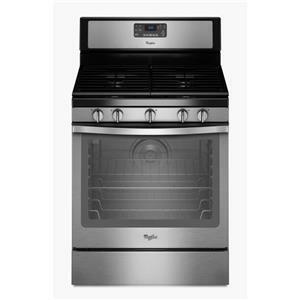 The Gas Ranges - Amana 30-inch Gas Range with Self-Clean Option by Amana at Pedigo Furniture in the Livingston, Onalaska, Trinity, Coldspring, Corrigan, Huntsville, TX area. Product availability may vary. Contact us for the most current availability on this product. Total Oven Capacity 5 Cu. Ft.
Amana Gas Ranges are for those who prioritize quality and reliability at a good value. Available in white, black and stainless steel an Amana Gas Range will fit any kitchen style and help you get a delicious dinner to the table. 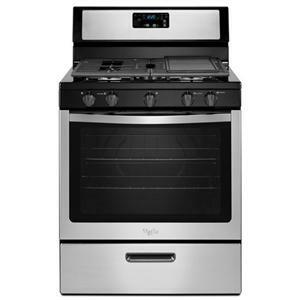 The Gas Ranges - Amana collection is a great option if you are looking for Appliances in the Livingston, Onalaska, Trinity, Coldspring, Corrigan, Huntsville, TX area.